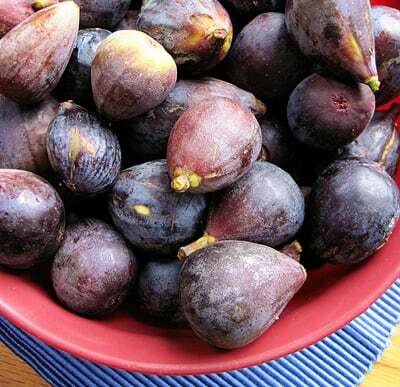 If you pay attention to the produce in the grocery store or at your local farmer’s market, you may have noticed figs are in season right at this time of year. Recently, a friend who lives in Los Angeles mentioned that she had an over-producing fig tree. Jokingly, I told her if she wanted to get rid of some of her extra figs, she could send them to me and I’d put them to good use. After a few emails, the figs were on their way to me in the mail. They arrived perfectly bubble wrapped in a box and as she had picked the figs before they were ripe so they’d survive being shipped cross-country, they were just starting to ripen. The sweet, earthy scent that perfumed my kitchen when I gently unraveled the bubble wrap was intoxicating. I washed the figs in cool water and as I dried them I started thinking about what I’d do with nearly five pounds of fruit. After eating a number of them just sliced and sprinkled with a little brown sugar or with plain yogurt, I finally decided to make my own mermelada, or jam. On my most recent trip to Mexico City, I remember having seen a fig jam recipe in a Mexican cookbook with a section on pastry-making, pan dulce and other delectable sweets. I knew I had seen the book at my favorite bookstore in Mexico City, but I couldn’t remember the name of it. I did, however, remember some of the technique to infuse chiles in jams and jellies. This recipe is my version of mermelada de higo using the infusion technique that I remember from the book. 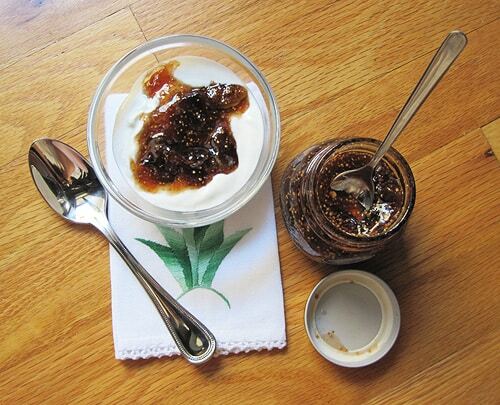 I chose to infuse this fig jam with chile ancho (dried poblano chile) for its mild heat and earthy flavor to complement the fig’s earthiness, and chile puya (which is like a smaller, more potent guajillo chile) for its sharp fruit tones and moderate heat. This mermelada is multi-purpose: it’s great for spreading on a hearty piece of toast or on crackers with cheese, in yogurt for breakfast or a snack, heated and spooned over vanilla ice cream or inside pastry crust for a buttery, flaky and spicy-but-sweet treat. 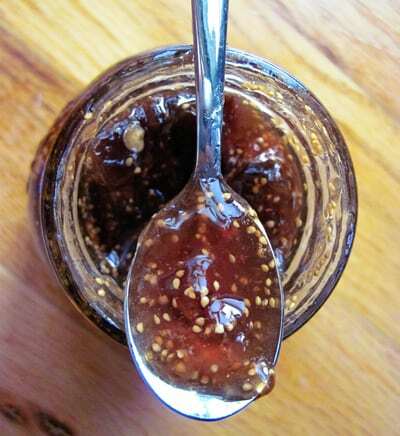 A sweet and spicy fig jam made with mission figs gets a rich, deep flavor and color from Mexican cinnamon and two kinds of dried chiles (ancho and pulla). In a small saucepan, add cinnamon sticks to water and bring to a boil. Reduce to a simmer and whisk or stir in sugar until dissolved. Add apple cider vinegar and allow the mixture to simmer for 5-8 minutes to steep the cinnamon. In a glass dish, rehydrate the chiles in warm (but not hot) water for 5 minutes. Let them soak while you finely chop the figs. Once the figs are chopped, place them in a deep saucepan. Using a fine mesh strainer to prevent any broken shards from the cinnamon sticks from getting into the jam, pour the syrup mixture through the strainer, over the figs. Reserve the cinnamon sticks in the strainer. Bring figs and syrup to a boil and then reduce to a simmer. Lay the cheesecloth over a bowl and add the reserved cinnamon sticks and the rehydrated chiles. Cut one lengthwise slit in the chile ancho. Tie the cheesecloth shut (you can use kitchen twine if necessary) and submerge in the saucepan with the figs and syrup. Allow to simmer for about two hours, stirring periodically, or until the figs and syrup reach a jam-like consistency. When the jam has reached the desired consistency, remove the cheesecloth and place it in the mesh strainer above the jam. Press the cheesecloth gently with a wooden spoon to remove any juice inside the bag. 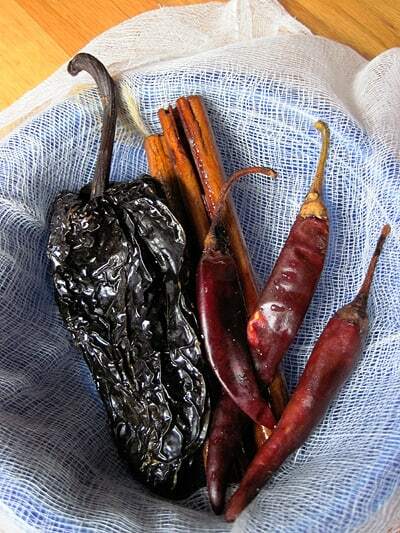 The chiles will have not only added spice and heat to the jam, but also a deep reddish-brown color. Spoon into small glass jelly jars using proper canning technique. I prefer Italian Bormioli Rocco “Quattro Stagioni” 0.15 liter jars for canning jams and salsas because they’re rounded and pleasing to the eye, as well as the perfect size to give as a gift. If you’d like the jam to be a bit spicier, add one more chile ancho (do not cut a slit in this one) and one more chile pulla with their stems trimmed, directly into the jam. Remove the extra chiles after one hour. Here are instructions for learning proper canning technique. As mentioned in the recipe, I prefer Italian Bormioli Rocco “Quattro Stagioni” 0.15 liter jars for canning jams and salsas because they’re rounded and pleasing to the eye, as well as the perfect size to give as a gift. Each jar holds about 5 ounces. You can purchase a set of 12 Bormioli Rocco Quattro Stagioni 5 Ounce Canning Jars from El Mercadito, my Amazon aStore (this is an affiliate link). Wow, this looks ridiculously good! I can’t wait to eat all your food in Chicago! And I feel special to have been privy to your “fig exchange” with Gina… so cool the twitter seeds of collaboration! And as always your photos are beautiful. I’m not a chile fan, but I love how you incorporate stories with the recipes. Love it. So nice of Gina – this looks so tasty. I’m desperately wanting to try a fig but I’ve never seen a fresh one in real life. I’m beginning to think it’s just a FIGment of my imagination. LOL. Ouch, so awful. Sorry. Fresca/fresh foods make all the difference. At the school where I teach we have a program where the children are introduced to unusual fruits, one time we received the freshest dates I’ve ever had! Que delicioso! They were a world apart from the dried out dates that we use to buy in a cardboard box from the grocery stores. You have a gift for writing a good story and recipe in a nice compact way. Makes me want to cook and write more. Gracias para el inspiracion.